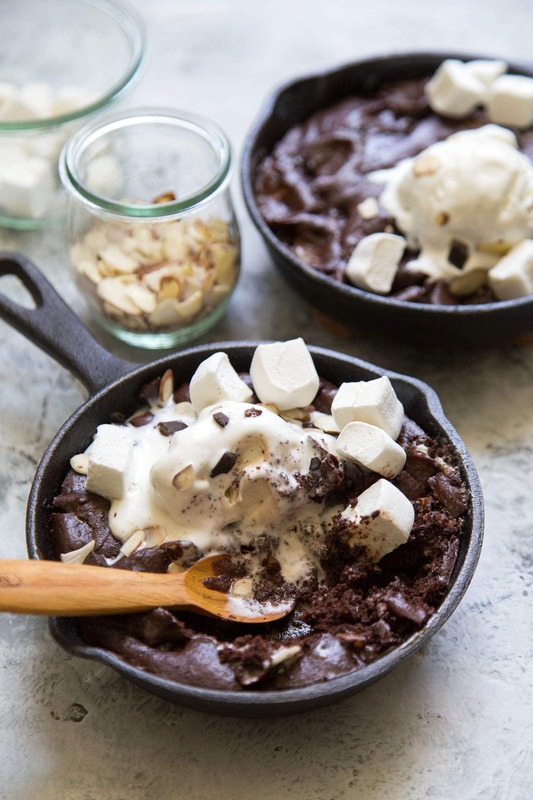 These skillet rocky road brownies are made with marshmallows, nuts, and chocolate chunks. Top it with a scoop of ice cream for the ultimate dessert. 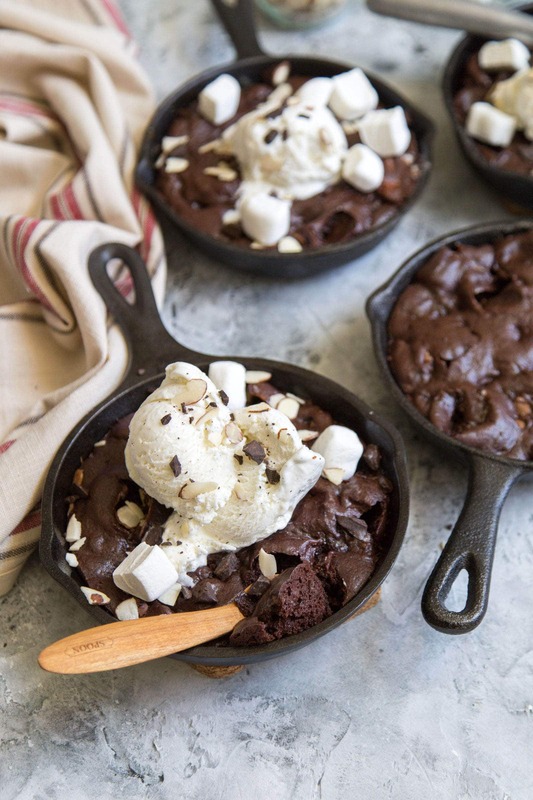 I made skillet rocky road brownies for three reasons. 1.) Chocolate is a must when you’re watching any Game of Thrones season premier. 2.) GOT is chock full of drama, obstacles, challenges, and bumps in the road. In the dessert world that translates to rocky road! 3.) 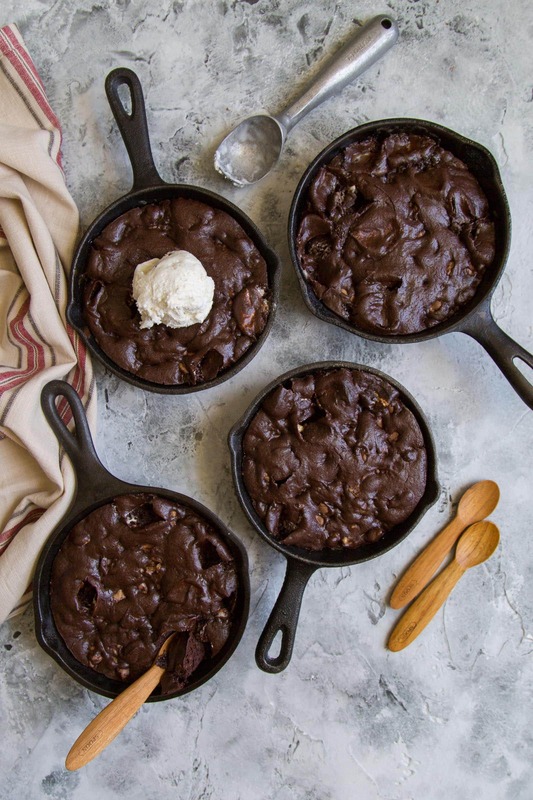 With these skillet brownies, everyone gets their own. No need to share! I’ve never been so excited for a television show. (SPOILER ALERT!) Watching Arya take major revenge on House Frey was 100 times more satisfying than watching Ross and Rachel finally end up together, Monica and Chandler with their twins, and even the ending of Parks and Recreation (my fav show ever). I’ll be glued to the couch every weekend for the next seven weeks. And yes, it’s likely I’ll be making some variation of skillet brownies as well. 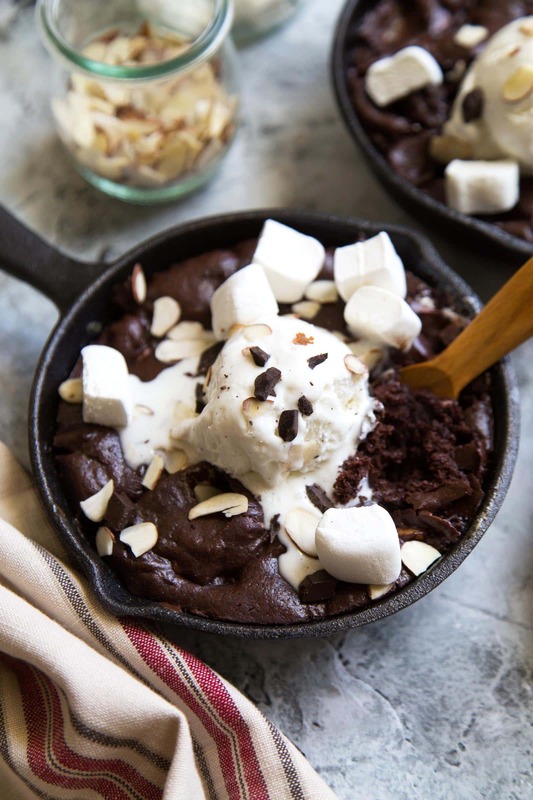 For the ultimate dessert, you could totally finish these skillet rocky road brownies with rocky road ice cream, followed with a chocolate fudge drizzle, whipped cream, and a cherry on top. If you’re feeling really crazy, try adding a scoop of my movie night ice cream! Or, you could stick to vanilla ice cream. I LOVE vanilla. Some people may say it’s plain or boring, but I think vanilla ice cream is fantastic with everything! Growing up, I wasn’t the biggest fan of rocky road ice cream. While I liked the mixed in marshmallow, nuts, and chocolate chunks, I’m not a chocolate ice cream person. Up to this day, chocolate ice cream is the LAST flavor I’d ever order. I’ll happily eat chocolate every which way, except in ice cream form. Strange, huh? This easy one bowl brownie mix is perfect for customizing. Don’t like rocky road? No problem. The mix-ins possibilities are endless: add a medley of chocolate chips, swirl in caramel, toss in chopped chocolate candy bars. And best of all, if you’re really pressed for time, you can totally sub in your favorite boxed brownie mix. I won’t tell. Preheat oven to 350 degrees F. Grease four 5-inch cast iron skillets with butter. Set aside. In a large heatproof bowl combine butter, chocolate chips, cocoa powder, and coconut oil. Place over a pot filled with 2-inches simmering water, making sure the bowl does not touch the water. Heat mixture until butter and chocolate have melted. Stir as needed to ensure even heating. Once mixture is smooth, remove from heat. Allow melted mixture to cool for 10 minutes. Stir in eggs, vanilla, and sugar. Once eggs have been incorporated, add flour, baking powder, and salt. Fold to combine. Add chocolate chips, nuts, and marshmallow. Fold until toppings have been evenly distributed. 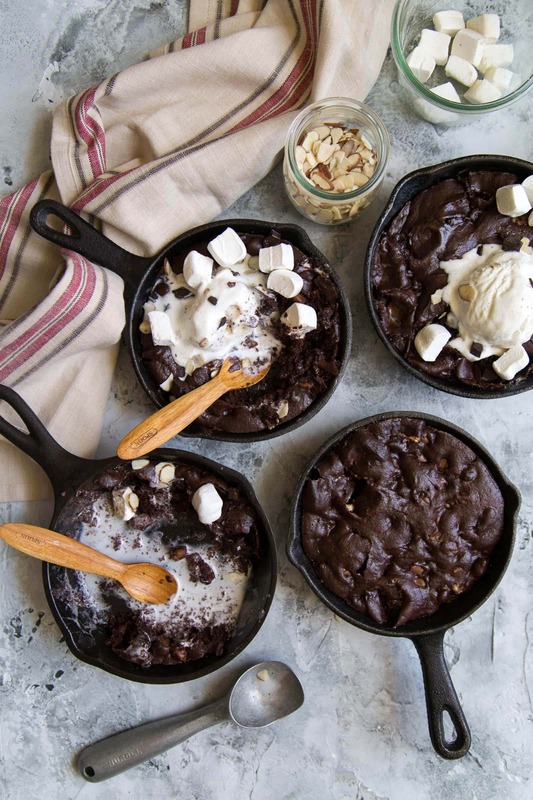 Divide brownie batter evenly among four prepared cast iron skillets. Place skillets on baking sheet tray. Bake for 18-20 minutes until the tops of the brownies are set. Do not overbake. Brownies will continue to cook in skillet out of oven. Allow to cool slightly and top with ice cream of choice. Serve immediately. Be careful not to overbake. Otherwise, brownies will be dry. Toothpick inserted in center of brownies should not come out clean. Pinning this because I really need to give this a try and my son would definitely go crazy for them and me too. Thank you for the recipe. Yes, definitely perfect for a movie night! Can’t wait to try it out! Yum!!! These look so yummy and so do so many of your other recipes! I’m so glad I found your blog I can’t wait to try this! This looks like the definition of Chocolate Heaven. I love that cast iron skillet action, too!! Yum!